CM Magazine: Uumajut: Learn About Arctic Wildlife, Volume 2. 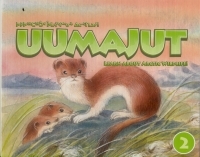 Uumajut: Learn About Arctic Wildlife, Volume 2. Neil Christopher & Louise Flaherty, eds. Written by Simon Awa, Seeglook Akeeagok, Anna Ziegler & Stephanie McDonald. Illustrated by Romi Caron. Translated by Leah Otak. Iqaluit, Nunavut: Inhabit Media, 2011. Learning about wildlife has been a lifelong passion of mine. As a young boy, I often accompanied my family on trips across the tundra where I saw many different kinds of animals in their natural habitat. I was fascinated by the different ways in which animals survive and flourish in the Arctic environment. I eagerly watched and listened as elders, hunters, and family members taught me about the many ways Inuit have relied upon wildlife for generations. The Uumajut series is that rare thing amongst nonfiction wildlife books for children: not just informative, but of national importance. In addition to facts about arctic animals, the series includes what kids can't easily find on the Internet: Inuit traditional ecological knowledge. In this the second volume of the Uumajut series, readers learn, for example, that wolf fur is "used for trimming parkas and mittens because it does not gather frost." Readers will also learn that Eider duck eggs are best gathered in mid- to late June, that every part of the walrus can be eaten, and that narwhal skin, which is high in vitamin C, is an important food source for Inuit. There are a number of books on the market that teach children "about" Inuit life. The beauty of this one is that it shares that life with its readers. The difference between the two is key. Through Uumajut: Learn About Arctic Wildlife, Canadian kids learn about the diversity of their country not as a lesson about a foreign culture, but as a lesson about their own. The warmth of Uumajut Vol. 2 is unmistakable, as is the care with which the book was produced. There is a lengthy dedication and introduction, as well as a two-page spread identifying the team responsible for creating the book. Oddly, these do not feel like clunky additions to the standard book structure. They have the remarkable effect of creating a community around the book-a group of people anxious that the reader learns to respect and appreciate what they do about the incredible fauna of our north. 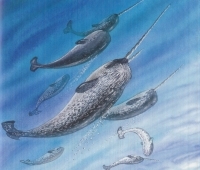 Kathleen Martin of Halifax, NS, is the author of seven nonfiction animal books for children (Lerner Publishing Group).